Usually, an RPG has more than one member fighting in the group – so let’s add a 2nd member to the player group. We’ll let Blue Pants join the player after we finished his quest. 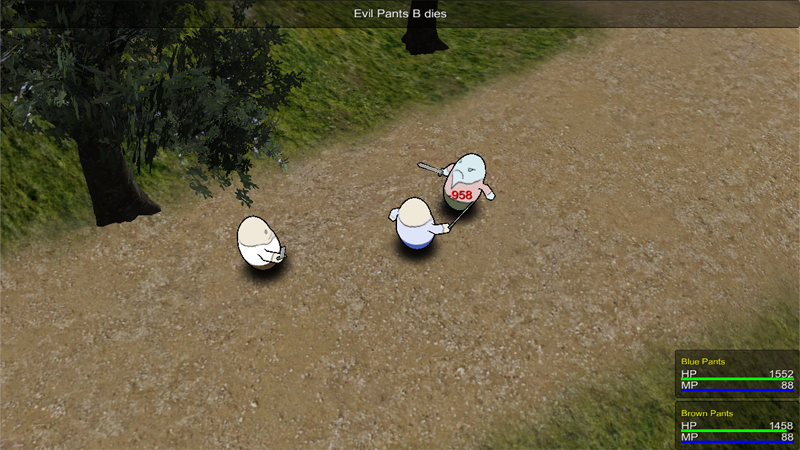 The new member should also spawn in the scenes and follow the player around. Additionally, we’ll add a new menu screen to manage the battle group. Seems like a lot of work, but it’s actually not that much – let’s get to it! First, we’ll create a new Move AI to let the new group member follow the player around. Open the ORK Framework editor and navigate to Combatants > Move AI. Create a new move AI and change the following settings. Change the first Check settings. Now, we need to add a new combatant for Blue Pants – to make things easier, we’ll just copy Brown Pants and do some changes. Navigate to Combatants > Combatants, copy Brown Pants and make the following changes to the new combatant. The prefab can be found in Assets/Tutorial Resources/Prefabs/Combatants/. We’ll give Blue Pants some other abilities, so remove all abilities first. Now add a new ability to the ability development. Remove all items from the start inventory. Change the Right Hand equipment. That’s it for Blue Pants. We need a new Menu Screen to be able to change the group members. Navigate to Menus > Menu Screens, add a new menu screen and change the following settings. Click on Add Menu Part and select Group. This will add a Group menu part. The action menu is used to select what to do with the group, e.g. change a member, remove a member or call a menu screen using a member. The action menu displays menu items that are added to it – the menu items define the action that will be used, e.g. changing a member. There’ll already be some menu items added to the action menu, we want three menu items in total. Change the following settings on Menu Item 0. This will change a battle group member. Change the following settings on Menu Item 1. This will remove a battle group member. The Remove item will use the settings (text, icon) defined in the Menu Settings. Change the following settings on Menu Item 2. This will close the menu screen. The Back item will use the settings (text, icon) defined in the Menu Settings. This box will display the current members of the battle group – if the battle group isn’t full, it will display empty slots. This will use the selected action’s menu item as title. This box will display the remaining group members that are currently not part of the battle group. That’s it for the new menu screen – now we need to add it to our Overview menu screen. Select it and change the following settings. Click on Add Menu Item to add a new menu item and change its settings. Set to: Manage your battle group. Click on Move Up to move the new menu item above the Exit menu item. We only want to display this menu item when we have more than one player group member – for this we’ll need a new requirement. In the new menu item, change the following settings. Click on the green plus button beside the Requirement field, this will add a new requirement and select it. Now, click on the edit button beside the plus button – this will take you to the Requirement you just created. Change the following settings. We need to turn on spawning the other members of the player group – navigate to Game > Game Settings and change the following setting. Now we need to do some small changes to the bluePantsDialogue event we created for the earlier quest of Blue Pants lost underpants. Navigate to Events and open the bluePantsDialogue event file by clicking on Open Game Event and selecting the event file. We’ll extend the event at the last dialogue of the quest, where Blue Pants says “Thanks for finding my Underpants!”. Let Blue Pants ask if he should join us. Set to: Hey, how about I join you for some time? Now, we’ll add a combatant to the Blue Pants actor, in order to use the actor for joining the player. By doing it that way, the actor’s game object will become the new player group member and follow the player around right away. You could also select Player. If you want, you can use the Level Settings to initialize the new combatant to a different level. We already used this step to add the player at the start of the game. This time, we’ll use it to join the Blue Pants actor to the player group. You can also use this step to add new members like we did in the start event to add Brown Pants. 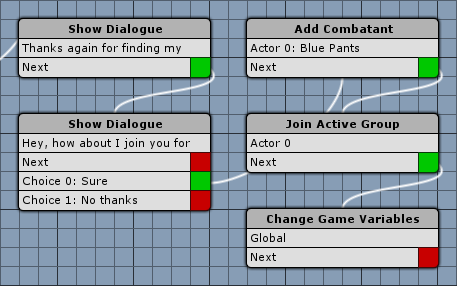 Finally, we’ll set a bool game variable to remember that Blue Pants joined the player group. We’ll use the variable in the Event Interaction of this event to remove Blue Pants‘ game object when returning to the scene. Click on Add Game Variable. And that’s it – click on Save Event to save the changes. As a last step, we need to make sure that the NPC_blue game object will be removed when we return to the scene after Blue Pants joined the player group. While the event will make the game object a combatant (which will follow the player around) when he joins us, this only happens when we play the event. When we return to the scene, the NPC’s game object will be there again and allow us to start the event. To prevent this, we’ll use the game variable we set at the end of the event to remove the game object. Open the town scene (1 Town, can be found in Assets/Tutorial Resources/Scenes/) and select NPC_blue in the scene hierarchy. Change the following settings in the Event Interaction‘s inspector. This will destroy the game object if the variable conditions aren’t met when loading the scene. And that’s all – the NPC’s game object will automatically be removed when we return to the scene after Blue Pants joined the player group. Open the main menu scene (0 Main Menu) and hit play. After finishing Blue Pants‘ quest (or loading a save game where you already completed it), he will ask to join you. If you accept, he joins the player group and follows you around – and battles will get a lot easier! And that’s it – this concludes the game tutorial series. While this is the end for the game tutorials, this isn’t the end of what you can do with ORK Framework! Want to check out some of the other features? Take a look at the various how-tos on specific ORK freatures. Need help or inspiration for game mechanics? You can extend the game in various ways, take a look at the gameplay tutorials. Want more tactical battles? Look into the grid battle feature and go through this 10 part gameplay tutorial series.